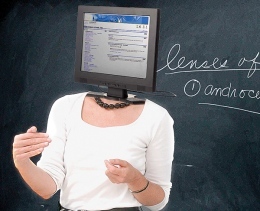 Online, Blended, or Face-to-Face Learning: Which is Best? Recently, I have been taking some google courses online and have been surprised by my reaction with the way I prefer to learn. I have always considered myself a “text” learner. I love reading and feel that I learn best that way, as I can go back and reread, go at my own pace, and have the ability to take notes as I please. This was the way I learned through university, and always just assumed it was the best way for me. However, through taking these online courses, I have found myself gravitating immediately to the video tutorials, and retaining the information much quicker and easier through watching a video, not reading the exact information in text. It brought me to question my traditions views on my learning style and why it has changed. It also led me to think about my students. Each student has a way they prefer to learn and a way that works best for them. Am I able to fulfill their needs throughout the day? Yes I use a variety of technologies, such as videos, iPads, laptops, as well as texts, and face-to-face interactions, but is this sufficient enough? What works best for them? Question #1 asked whether teachers worked in schools with online, blended, or face-to-face learning, so I’ll skip that question and jump right into the good stuff! For your reference, f2f means face-to-face. Question #2: What do we see as primary advantages of online learning over f2f courses? Question #3: What do we see as the primary advantages of teaching f2f over teaching online? Question #4: How can blended learning take advantage of opportunities in both online and f2f settings? Question #5: Teacher PD/training for online and blended courses is paramount… what’s your best resource? Question #6: For those of you who teach, blended or online… what’s your top piece of advice? 1) Blended learning appears to be the best option for learning. It allows that face-to-face contact, the ability to build those strong relationships with your students, chance to reach all learning styles, and still allows for continual learning and reviewing outside of the classroom. Learning becomes accessible to all students, anywhere. I wonder though how much additional work this requires? In a profession where there never seems to be enough time, it is attainable? Or is it one of those learning curves that takes awhile initially, but once you’ve mastered it, it’s just like typing out a lesson? 2) In our modern world, I believe it is a teacher’s duty to expose and teach kids about technology, the different tools, how to use it, and how it can help them learn. We are educating our students for jobs that we don’t even know will exist, so we need to provide them with the tools to be successful in the future. We must! Below are a number of resources that were also provided through this chat. Thanks again to everyone for sharing their incredible ideas and knowledge. This entry was posted in Approaches to Teaching and Learning, Career Long Learners, Environments Conducive to Student Learning, Students' Learning Needs and Progress and tagged #edtechchat, blended learning, face-to-face learning, online learning by ekpetley. Bookmark the permalink.